It’s days after the Fourth of July, and you’re still blissfully digesting all the delicious tauntaun burgers you had with your fellow Jedi. Mmm. You let your ears devour some of the latest audiobooks in the Star Wars Expanded Universe. Now, with the rest of the season ahead, it’s time to expand your mind with a few more literary epics. 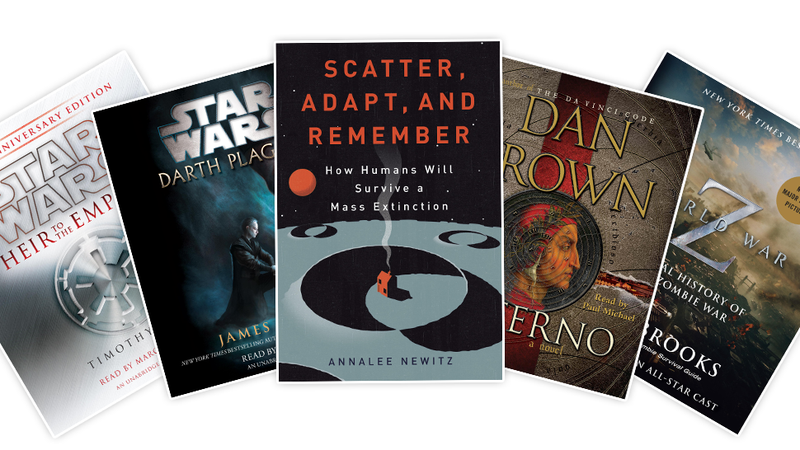 io9’s own EIC Annalee Newitz walks readers through how, yes, the world is probably going to end. In fact, cataclysm after cataclysm in Earth’s 4.9-billion-year history has resulted in mass extinctions. But, instead of fearing the next world-shattering disaster, we have every reason to believe that humanity has a fighting chance for the next million years. World War Z, written by Max Brooks, is already a crowning achievement in zombie fiction. There's even a movie about it in theaters. No big deal. To celebrate, this edition of the 2006 bestseller features new narration from the likes of Martin Scorsese and Nathan Fillion, as well as cast members from Star Trek and Battlestar Galactica. Readers who remember the horror that was the Battle of Yonkers can now relive the zombie war with fresh ears. Dan Brown’s stalwart master of religious symbology and intrigue, Robert Langdon, returns in Inferno, and a new game is afoot. Set in modern-day Italy, Brown’s latest work weaves the themes of Dante’s original magnum opus into the realm of classic art and cryptic puzzles. Remember when Chancellor Palpatine told Anakin Skywalker about the Tragedy of Darth Plagueis the Wise in Episode III? Darth Plagueis: Star Wars, written by James Luceno, finally tells the tale. Darth Plagueis was one of the most brilliant Sith Lords who ever lived, and was as ruthless and power mad as any member of the dark religion could be. He gained mastery over life and death, and through his apprentice Darth Sidious, spread his influence across the galaxy. But, powerful as he was, he could do little to prevent his inevitable fall. This book is a big deal. As the first entry in the landmark Thrawn Trilogy, Timothy Zahn's Heir to the Empire reinvigorated the Star Wars Expanded Universe for a whole new generation. Taking place five years after the destruction of the second Death Star, Han and Leia are expecting twins, and Luke has become the first new Jedi Knight since the Purge. But, as the galaxy heals itself, Grand Admiral Thrawn, the last of Emperor Palpatine's warlords, has taken command of the Imperial fleet and is ready to rebuild the broken Empire. This is your new summer listening list. So go ahead and check out the rest of rest of Random House Audio’s audiobooks before the leaves start to change.